OK, hold on to your hats. This is earthshattering news: The cat woke me up at 6am and I woke right up, felt fine, and didn’t need to go back to sleep! Anyone who knows me knows that This.Never.Happens. For my entire adult life, I have needed more sleep than anyone else I know (I don’t usually get it; but, I need it to function well). Since being diagnosed with Hashimoto’s Thyroiditis (5 years ago) this has become even truer. I have not woken up early, ready to function, in forever. When I heard the cat scratching at the door, I thought, “Oh, no! It’s way too early, oh no, oh no.” Then I sat up and realized I felt fine. I let the cat in and stayed in my warm bed for 30 more minutes, eventually getting up because I realized I was ready to start my day! When I came downstairs, Dave looked at me and asked, “Who are you, and what did you do with my wife? !” I tried to explain that I was awake. My eyes were open. My brain was (almost) fully functioning. I was NOT in a horrible mood about being woken up early. What the…..? I did a really hard workout yesterday, so I expected to wake up feeling slightly awful; so this was a pleasant surprise! I realized that I slept better last night than I have since before Thanksgiving. I fell asleep quickly, stayed asleep all night, and woke up happy. Could it be that I haven’t had my usual glass of wine or NorCal Margarita with dinner? The complete absence of any added sugar from my food/drink intake? That I had a great workout and lots of fun meeting a new friend? That I only had one cup of coffee first thing in the morning for the past few days (not 3 cups throughout the day)? That I went to bed in my completely dark room at 10:30pm? Who knows; but, I’m intrigued to find out if this happens again tomorrow. It just MAY be worth 30 days without cream in my coffee if I can wake up feeling like this even several days a week! Once I started moving around the house, I realized I needed to move and loosen up from the workout. I drank half of a small can of coconut milk along with my coffee and put on all of my warm clothes to go for a walk. Dave and both kids looked at me like I had just landed from Mars. When I said that I was going for a walk (it was less than 30 degrees and windy), I think they thought I was kidding. I wasn’t kidding! I went for a 30 minute walk as the sun was coming up and felt nice and loose by the time I got home. 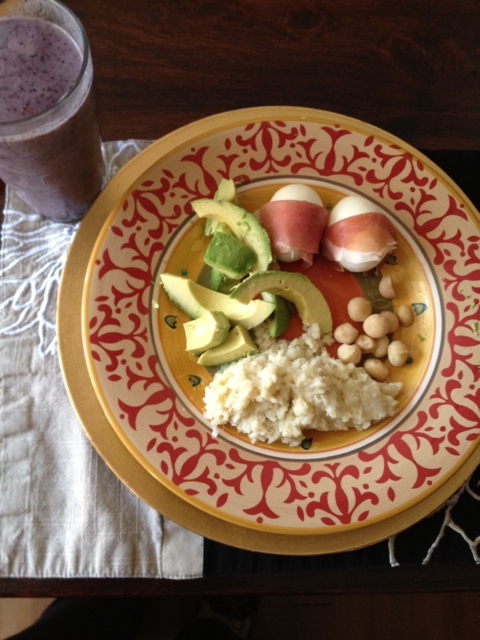 I did some easy yoga and then made breakfast – a smoothie (other half of the can of coconut milk, frozen banana, blueberries, and water), 2 hardboiled eggs wrapped with prosciutto, avocado, macadamias and the last bit of cauliflower mash. Great start to the day! I treated patients all day today, and only had herbal tea and an apple until about 4pm, when I went to our favorite hangout to get some food with a co-worker. We go there all the time, and they ask if we want our “usual.” My usual is blackened burger, medium rare with blue cheese, no bun, and spinach salad. Today we had a new server, and I started explaining burger, no bun, no cheese, no fries, salad with no parmesan and water. He just looked at me, so I tried to explain that I’m not high maintenance. He nodded his head like, “Sure you’re not.” It was awkward – I used to pride myself on the fact that I would eat anything, then I had to eliminate gluten, then it was a little weird to go Paleo but people were used to my restrictions, now it is even more difficult for people to understand. In any case, we split the burger and salad and were both full! (No photo, sorry). 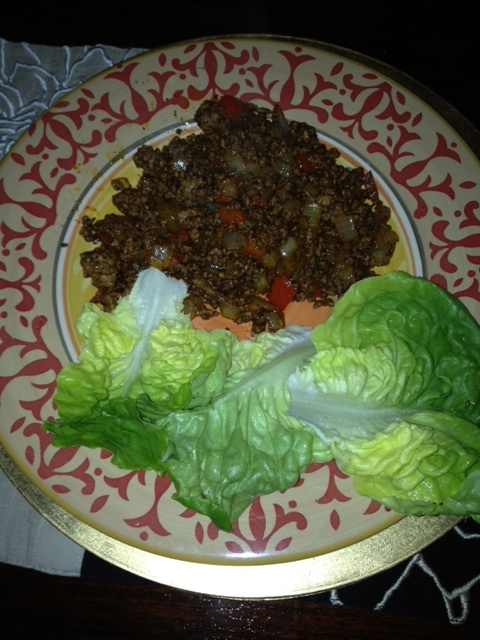 I didn’t get home from work and running the kids around until 9pm, so we had a quick, easy repeat of the lettuce wrap tacos from the other night. Yum! I’m interested to see if I wake up bright and early tomorrow with a smile on my face…….. I have been known to bribe my kids to let me sleep past 8am. I beg them to go away and leave me for 5 more minutes in my beloved bed. This morning at 7.15 I felt like Ned Ryarson in Groundhog Day BING! I was awake. No dosing off, no sleepy yawns. My kids were still asleep and I was catching up on the world. I know! I almost miss my ability to sleep until 8 or 9 am if left alone and on a weekend……now, 6:00, 6:30 BING! Wide awake! I get a lot more done, though!